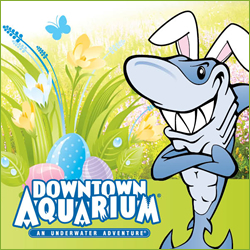 Celebrate Easter this year at the Denver Downtown Aquarium. Have Breakfast with the Easter Bunny the Saturday before Easter. Photo opportunities with the Bunny are also available. And don’t forget about the EASTER EGG HUNT! Kids 2 and under free with Adult ticket purchase. Get discounts on exhibit entry and retail purchases while at the aquarium as well. Happy Easter!